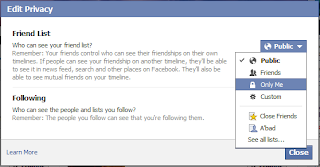 You can Hide your friend list in facebook. Just Follow this Steps. >>> Goto your Facebook Time Line. >>> Now Click on Friends. >>> After that Click in Edit Button. Which is at left side as Shown in image. >>> Then Click on Edit Privacy. >>> Now just set only me for Friend List. >>> Now any one can not see your friends. Even your friend can not see.